Are you accustomed to going to the drop-down arrow in the top right of your Facebook login and then selecting “Use Facebook As” and your business name? If so, you may be surprised to find it missing one day soon, if it’s not missing already. This has been going on for several months now, and people have been running into this issue everywhere, and posting in multiple places for help on Facebook. In some case its still “business as usual” where the user can simply change the option and “use Facebook as” their business, and the other Facebook has moved them to a new interface where they have to change identities on a case-by-case basis for every comment, post, or like. Facebook seem to be converting users over VERY inconsistently, so I thought I would make a short video demonstrating the two different scenarios are for using Facebook as your business. So? Is your own option to “Use Facebook As” missing? Thanks for the help. Since you have helped me, I would like to return the favor. If you have kids of college age, send then to any where by an Ivy League school. make then get a hard job. Then they will appreciate good jobs. So, how do you see the feed of updates from the pages you’ve liked as your page, if you don’t have the Use Facebook As.. option anymore? 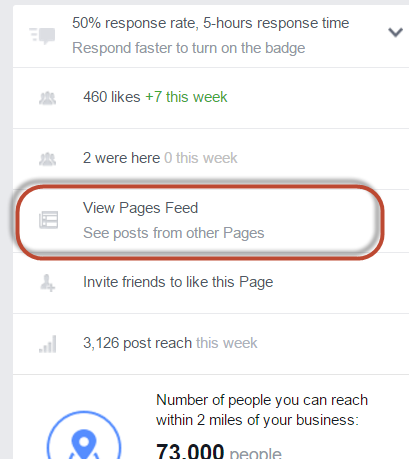 https://www.facebook.com/pages/feed only shows info from pages you’ve liked personally, and not those you may have liked as your business page. I agree, it’s really stupid. If you can no longer “use Facebook as…” then you can’t see them anymore – At least not that I know of. This is the part that is horrendous. I run a page for a major non-profit that has multiple sub-divisions throughout our state, we have of course liked the pages of all of our sub-divisions and we always want to share their content. This has now become impossible because the newsfeed has gone. I would have to visit over 100 pages one-by-one to see if they have posted anything new and if I want to share it. I was switched over by FB about a year to the new Business Page format. Since then, whenever I click the View Pages Feed on the left side, like everyone says to do (and as you mention above), it does open up a different page…, but then that’s it. The Feed never actually uploads or resolves. Ever. No matter how long I wait: 10 minutes. 15 minutes. Nothing happens, not a single post loads. Nada. It’s been like this for the past year, ever since The Switch. For me, when I click View Pages Feed, I only see posts from Pages I liked personally, not the Pages that my organization has liked/followed. If you no longer have the “Use Facebook As” option, but you still don’t see the info, then perhaps you haven’t got the usual type of business page? Maybe it’s an “organization” as you’ve said, or even one of the old “business pages” that someone made which is actually just a regular user page? What’s the URL of the FB page? For example, my page is https://www.facebook.com/SearchCommander/?ref=br_rs – so I strip out this “?ref=br_rs” and add “pages_feed/” in it’s place – so my business page feed, is this – https://www.facebook.com/SearchCommander/pages_feed/ and from there I can see only the activity of the pages which I have liked AS my business page. Thank you for this! My account was very recently changed, and I’m glad to have found this post! I was annoyed that I could no longer see the page’s feed. I’m sure I would’ve eventually found this, but not without much frustration and cursing at FB. Thank you! It is so frustrating having to change everything all the time. It was much easier the way it was. I use my page for my author page and half the time it gets all mixed up with my personal page. Frustrating. I think the old way was working way better if one is using facebook only as a business. Thank you for your article. Appreciated. Ughh I hate what Facebook has done. I don’t want all my page feeds mixed up any old way. I am even seeing posts which are not pages. Just normal FB posts that I see in my profile timeline. I think this will kill Facebook for business. but I may be wrong. The network effect is far too strong to kill Facebook at this point. It’s infected everyone on the planet. The Facebook product was essentially “feature complete” years ago but they have a lot of people on payroll that have to Do Something™, so you get changes like this. I guess it’s good that people are employed. This was very helpful Scott. I wasn’t aware of the changes so your explanation was greatly appreciated. I no longer see a way to write a review as a business. Am I missing anything or is that option gone? You’re welcome, Michael. Hmm, interesting… I do know that it’s always been allowable to write a review AS a business on Google, I’ve never actually done one, and I didn’t know that it was ever possible on Facebook. Looking just noiw though, no, you’re right. While you CAN comment or even post on pages that allow it “as a business”, there’s no identity selector in the reviews area. Why is there no public (and easy to find/understand) changelog for users so we don’t have to spend hours/days/weeks searching for answers?! You’re welcome, you’re welcome, you’re welcome – and yes, a changelog for Facebook would be fantastic, wouldn’t it? Anyone know how to see the names of people you recently Liked the Page? Thanks! “Have an optimal day!” Brilliant. And thanks for the help. A guiding light in the labyrinth. What a nightmare. So laborious. It also seems that via Android app it is impossible to use your page other than posting and replying to comments. So much more restrictive and unhelpful. Thanks for explaining! Thank you! I thought I was going crazy! Rather more labourious but thanks for showing us where everything is now. I just hope they sort out the pages app now as the newsfeed there disappeared ages ago and basically all you can do there now is post stuff to your page. I don’t even have the “comment as” option!! It’s like Facebook doesn’t want me to be able to use my business AT ALL!! Brilliant, thank you for the advice – why the constant, frustrating changes though?! A necessary evil! It looks as if this has changed again. On the left of your page, go to “see pages feed” and on THAT page, top right corner, there should be a green box that says “LIKE OTHER PAGES” and there you can enter the FB name of the page you want to like and it will search and like it for you. Whew! What a PITA! Thanks for this post though Scott it helped with my immediate issue but there must be thousands if not millions of people really frustrated with this change. Ah, I am glad I found this post. We have a handful of Facebook page management clients and this option was the best way of interacting with other pages as your business/organisation name. I’ve passed this onto the team, very much appreciated! When I reply to customers now through messages, it shows as my name responding and not the company. I’d prefer my personal account name not to show. Is there anyway to change this? Have you changed the “responding as” on the right side, like the video shows? If so, then the name you see after posting is just for your reference – Who posts on a company page or replies to a comment etc. is ONLY visible to admins, so you as the business owner know which admin user posted on behalf of your company. oh – Sorry – you said “through messages” – you mean through the messaging app? Yeah, you can’t do that, you’re right. Use the “Facebook for Pages” app instead of FB Messenger to respond messages. I still can’t log in Facebook as a page even if i did what you say on video please any help ?? Can you send a couple of screen shots demonstrating that the options I describe in the video are not there? sorry but I’m new on this site how can I replay with a photo do u have an email I can send you the screenshot ?? I mean that I know how to make a screenshot but what I don’t know is how to upload image in comment ? You can’t upload in comments. You need to use that service to both CREATE the screen shot, then share the link to the screen shot which is shown to you immediately after you CTRL+V. It’s free and it takes just a second.